HAVANA, May 22 2013 (IPS) - When Gabriela Blanco tells other Cubans that she works in an organic vegetable cooperative and is getting ready to study agronomy at the university, she gets surprised looks. She is not sure where her vocation came from, but she does know that this is what she wants to do. In Cuba, which is seeking to boost agricultural yields, there is a scarcity of young people working in the sector. 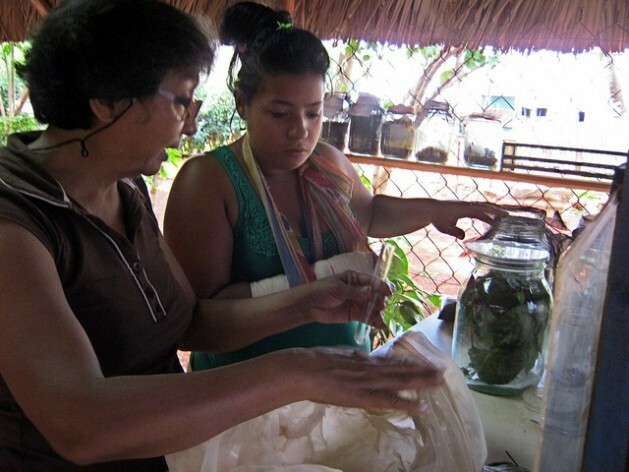 Blanco, a petite 20-year-old, dropped her math studies after two years to try her hand at the Vivero Alamar, a successful agricultural cooperative in Havana that operates as a Basic Unit of Cooperative Production. “I began working here in September 2012; in three months they made me a member of the cooperative. I realised that I really like it and I want to stay here. The agricultural sector has lots of possibilities and many fields of investigation; it’s a very interesting and lovely experience,” she told IPS. Mercedes Cepero, 18, has had a similar experience, although she came to this cooperative to fulfil her professional training requirement as an agronomy technician. “I’ve passed the student stage, and now I have to get trained and learn as a worker. I used to think that agronomy was just working with a hoe in the sun, but I was wrong,” she told IPS. Cepero is also preparing for university entrance exams, which will be held this month, because she wants to be an agricultural engineer. Unlike Blanco, she was told about this career when she was in secondary school. “That was when I became interested,” she said. Blanco thinks that the lack of interest in agricultural careers among young people is due in part to today’s society. “A lot of people see agriculture as something that is not studied, that doesn’t involve science, because it’s just planting and harvesting. Other people view work in the countryside as a lot of hard work that brings few benefits,” she said. Twenty young people, between the ages of 17 and 30, work at the Vivero Alamar. However, most young people leave agriculture when they find jobs that are more in line with their aspirations for better incomes and less hard work. Cepero has little patience with the general attitude toward agricultural work: young people “are a little bit lazy, and they want everything to just fall into their lap,” she said. According to figures provided by the national urban and suburban agriculture programme, about 70,000 young people in this country of 11.3 million are working in agriculture. The Vivero Alamar urban farming cooperative is located in the housing project of Alamar about 15 km from downtown Havana. The housing development is home to about 100,000 people. Research by the Centre for the Study of Youth has found that young Cubans prefer to seek jobs in the emerging economy, such as foreign companies, and reject jobs related to sanitation services, construction and agriculture. “People view agriculture today as if it were punishment. Whoever misbehaves will go work in the fields. The children of farmers do not want to continue their parents’ work; they want to move to Havana and become doctors,” said Isis Salcines, who describes herself as a worker-of-all-trades at the coop, and who is about to graduate as an agronomist. Shortly after beginning her university studies, Salcines decided to create a kind of vocational club at an elementary school close to the coop, dubbed “Agro-ecological Kids”. But first she conducted a couple of surveys. One asked, “What do you want to be when you grow up?” and another asked them to complete the sentence: “When I grow up, I want to be.…” with farmer as one of the choices. Not one of the children chose farmer. Salcines, who is the daughter of the coop’s founder and president, Miguel Ángel Salcines, set herself the goal of holding weekly sessions to teach the children about how the coop is run using agro-ecological methods, and why it is important to eat healthier. By the time the first course was over, the “Kids” would eat every bite of vegetables they were served in tasty salads, and they knew how to work on the farm, understood the importance of producing food, and had learned about the comprehensive management of pests and diseases. In a new survey she conducted at the end of the first workshop, 15 of the boys and girls – nearly three-quarters – marked agronomy as a possible career. “This experience was a real incentive. It made me see how it was possible for them to choose this line of work once they are grown-up,” Salcines said. For Norma Romero, a plant protection engineer, the formula must include education from an early age and assurances for young people that they will feel recognised, motivated and encouraged to continue working in agriculture, despite any difficulties. Good wages, a flexible schedule to allow them to study, free breakfast and lunch, work clothing and shoes, and other benefits are motivating factors, “because in agriculture there is mud, lots of sun, dust, and really hard conditions. For us it is vital for people to come and stay, especially young people,” Romero said. As part of the recent reforms of the Cuban economy, the Education Ministry expanded in 2011 the number of agronomy specialties offered at the vocational school level and ordered a reinforcement of vocational guidance toward agriculture in the early years of primary education, in line with the characteristics and needs of each province. Agriculture accounts for 20 percent of total employment but less than five percent of GDP because it has the lowest productivity of any sector. Last year, the country imported 1.6 billion dollars’ worth of food.